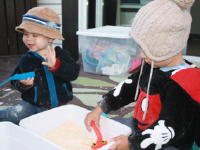 Two products designed for use in outdoor sandboxes or with indoor sand tables were put to the test. Here are the results. You will find both products on the educatall online store. Both products are designed to be used with sand. The sand brick and its trowel are very simple to use. 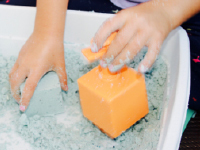 Children simply fill the container with sand and turn it upside down to create a rectangular sand brick. The brick and trowel are made of thick, colourful plastic and are therefore quite attractive. An adorable turtle can be seen on the top of the brick while a smiling face decorates the trowel. I chose to test this toy outdoors. 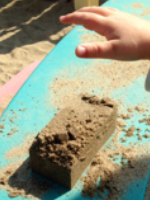 Obviously, the sand must be wet to successfully create brick shapes. 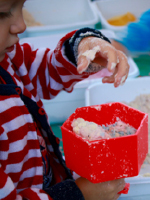 The toy test was performed with a group of toddlers between 16 and 18 months old. Children demonstrated an interest in the product. 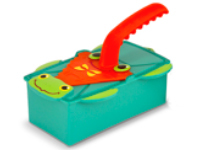 This toy includes five different shapes (triangle, diamond, rectangle, hexagon, and square) as well as a trowel. It is also made of thick, colourful plastic. It comes with a mesh bag that can be used to store the various parts when they are not being used, a practical element. Each shape has three parts: a container, a rod, and a plate. Once the parts are assembled, the rods make it easy to push the sand out of the containers. It's just like pressing liquid out of a syringe. 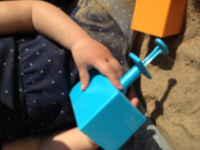 The toy was tested with Isabelle's daycare group made up of two infants, two toddlers (2 years old), and two older children who will soon be 4 years old. Younger children required assistance to create the various shapes whereas older children were able to succeed without help. One little girl (who will soon be 4 years old) figured out how to use the Sandblox on her own. She spontaneously began filling the containers with sand and even thought of pressing down on the sand to make sure it was compacted. 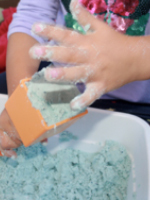 She then turned the containers over and pressed down on the rods to release perfect sand shapes. The children were also interested in using the trowels. They enjoyed digging them into the sand. 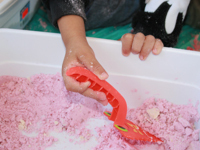 In the picture below, the trowels from both toys were being explored. 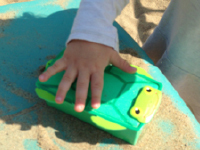 Although the turtle-themed sand brick is very cute, I preferred the second toy. 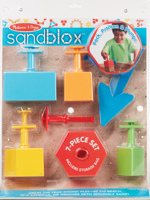 The Sandblox are quite original. I had never seen anything quite like them before. The shapes are all different sizes. The red and blue ones are the biggest. However, their format is still suitable for indoor use.